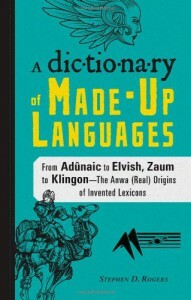 A Dictionary of Made-Up Languages is a very disappointing reference work. The author’s overbroad definition of “constructed language” includes everything from Quenya, the language of Tolkien’s High Elves, to Krakozhian, the language of the mythical country Tom Hanks comes from in “The Terminal.” One is a fully developed language with a grammar, syntax and vocabulary that fans learn. They maintain websites, write theses and converse in the language. The other, as far as I know, is a collection of Slavic-flavored words used to give an already-forgotten movie verisimilitude. Krakozhian supplies information (loosely defined) in seven categories. Who speaks it? People of Krakozhia, of whom we meet one – Hank’s character Viktor Navorski. Documented by? Steven Spielberg directed. What’s behind the words? A summary of the film’s plot. From whence is Krakozhian derived? Apparently it’s an ersatz Bulgarian. Linguistic characteristics? It sounds Slavic. Philological facts //www.imdb.com/title/tt0362227/?ref_=fn_al_tt_1">page on IMDb. I fail to understand why there’s an entry for Krakozhian. I could go on for any number of entries but I’ve made my point. The author lacks a discriminating eye [Note 2]. This would have been a far more useful and interesting book if he had focused on more-developed conlangs. There was one omission I found odd considering the dross Rogers included and that’s no entry for [a:M.A.R. Barker’s Tsolyani. Here we have a language for which fans have created fanzines and websites, and for which there’s a rich corpus about its grammar and literature, yet it doesn’t even get the page that Gobbledegook, the language of J.K. Rowling’s goblins, merits. Similarly, I question why the author mentions only Verdurian of the many languages Mark Rosenfelder has created for his fantasy world Almea. Rosenfelder devotes a great amount of energy to developing realistic conlangs, with detailed grammars and snippets of literature, but Verdurian gets a page and a half, mostly fluff. Perhaps I’m misunderstanding Rogers’ purpose in putting this information together but I didn’t find much of use or real interest here so I can’t recommend it. Note 1: I’m not sure but I believe the author’s grasp of “philological” is fatally flawed. Another example of a “philological fact” found in “The Old Tongue” entry is “I should mention that the aforementioned Conan novels are some of the best in the post-REH stable. It was a literary reboot of a series that had been languishing in the unimaginative hands of Lin Carter for far too long. Note 2: This is the second reference work I’ve read recently where the author exhibits such a lack of judgment (see my review of [b:Doctor Who Character Encyclopedia). Neither seems able to distinguish important material from drivel.